Last week Jessica (Real Life Styled) and I had the opportunity to visit Mayfair Centre in Victoria. 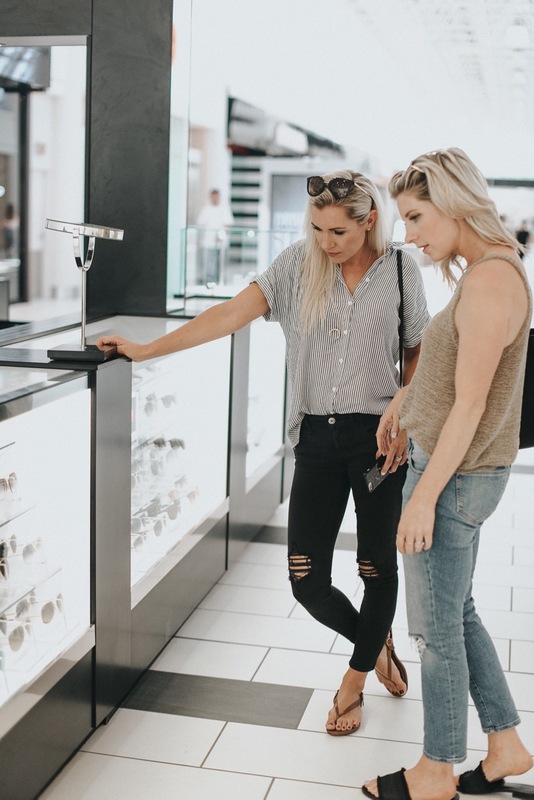 We headed over on BC ferries for a quick one night getaway, to check out what was in store for summer at Mayfair Centre, and to shop the top summer trends. Jess and I are both very familiar with Mayfair Centre, as it is a place where we have both shopped several times while visiting Victoria. Conveniently it is located on the outskirts of downtown, so you pass by it as you enter and leave the city. 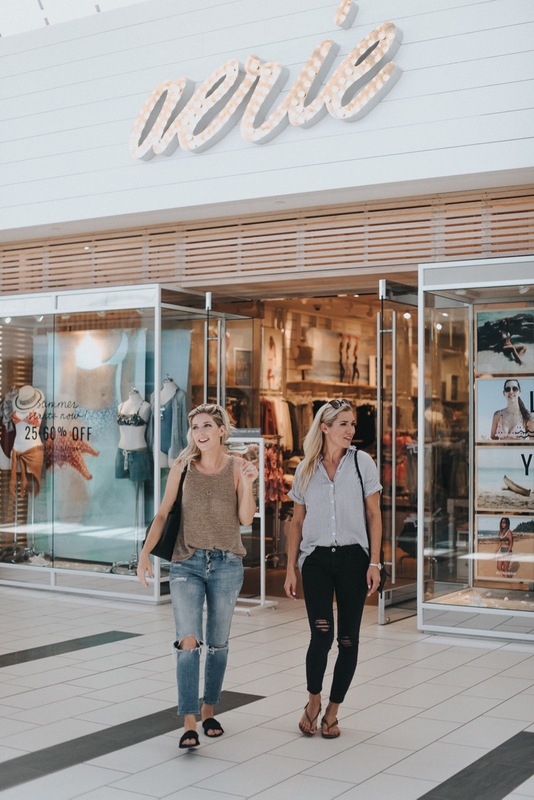 If you have extra time before your ferry, this is where to spend it 😉 They have a variety of stores, with even more coming this fall! We started our day by fueling up on our favourite coffees from Starbucks, which is located at the entrance to the mall. Have you tried their new Cascara cold foam cold brew?? I highly recommend it! With no kids to chase around, Jess and I were actually able to sit and enjoy our coffees, and chat about where we wanted to go in Mayfair! First stop was Aritzia, a favourite amongst many women in Canada. 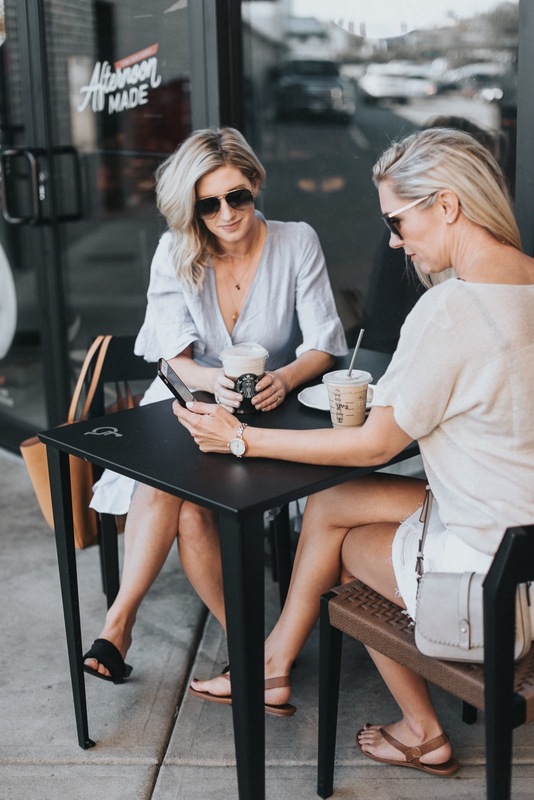 There were so many cute styles in store for summer that Jess and I didn’t know where to start!! 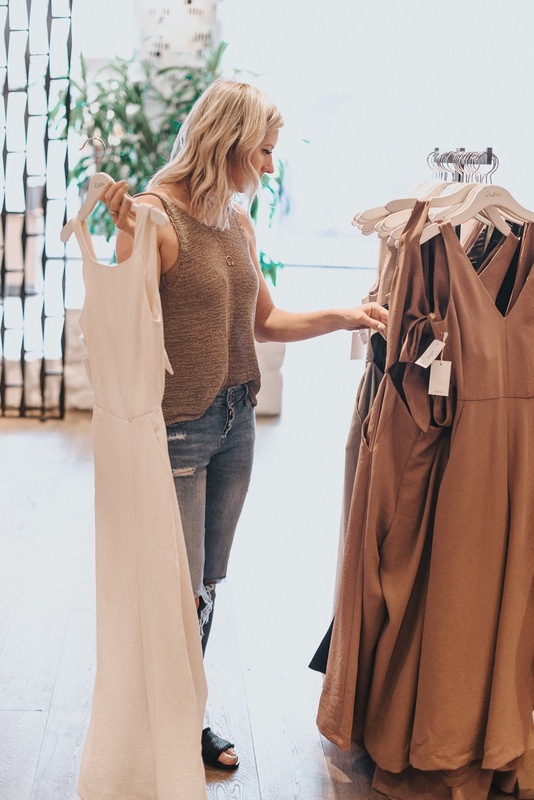 The friendly staff were so helpful, and assisted us in finding the top trending styles that would work best for our body types. This is so important when dealing with trends, as you want to know what works best for YOU, not just base it on what’s most popular. We loaded up our change rooms and started trying on! As someone who does not wear a lot of colour, I loved the selection of minimal prints and neutrals to mix into my whites, blacks, and greys. linen – dresses, skirts, tops, pants – you name it! Linen blend materials are very popular this season. 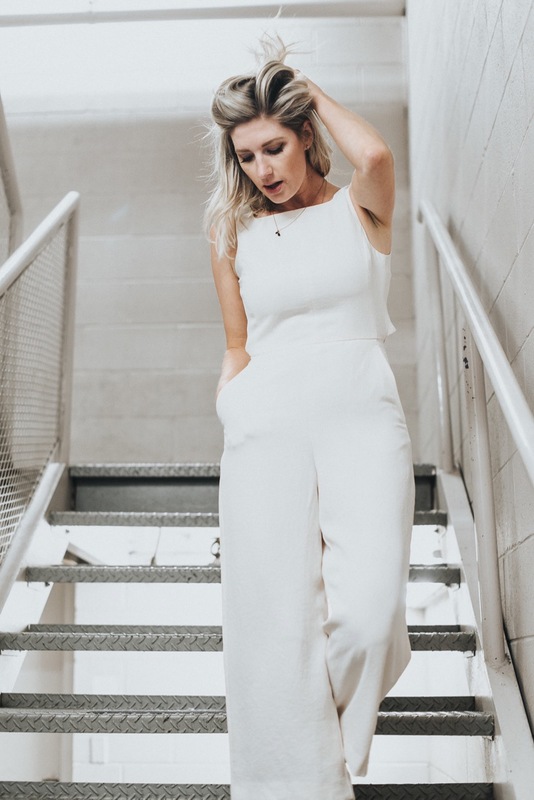 jumpsuits – slim leg, culotte. Romper, or full leg, This trend is BIG for summer and works for many body types! 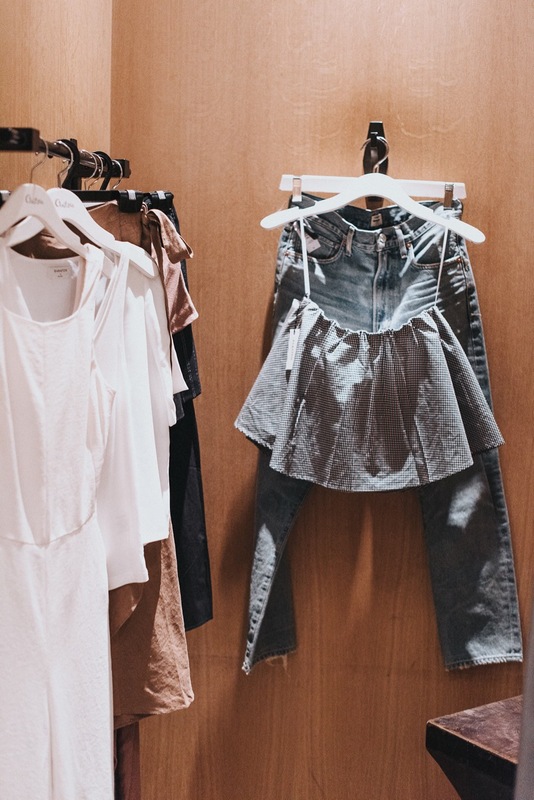 denim – lighter washed, cropped, mid to high rise, distressed shorts. A great pair of denim and denim shorts are essential this season! button detail – on tops, dresses and skirts. I love the fifties vibe, and classic tailoring. It adds a nice detail! Jumpsuits are everywhere at Mayfair!! They are a great alternative to a dress, and can be worn casually or dressy. This Ecoulement jumpsuit from Aritzia comes in a variety of colours. I love the back bow detail! Paired with a slip-on mule from The Bay. kitten heels – great for those who don’t like to wear heels, and much easier to walk in! 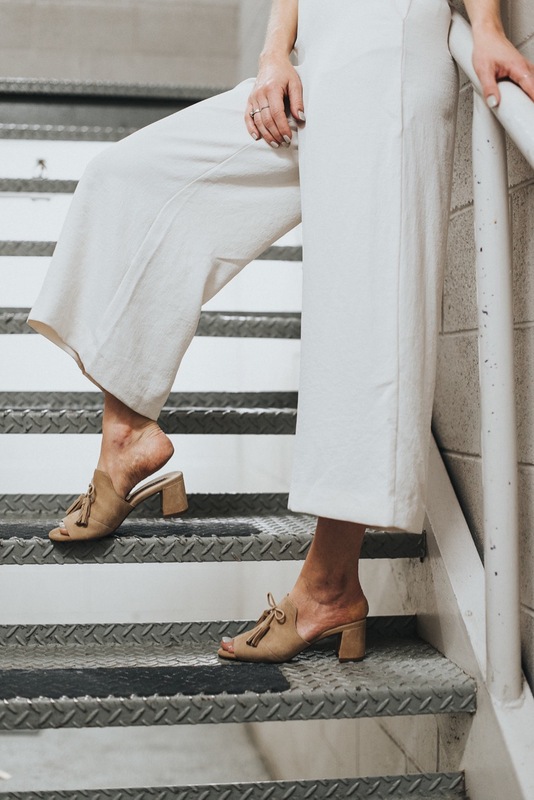 mules – sandals, closed toe, flat or heeled. Mules are still an essential this season when it comes to shoes! block heels – another walkable heel that can be worn all day! There are a variety of styles. We found some great options at The Bay. Summer Essentials – Shop this cute beach look at Mayfair!! They have all your summer staples to make sure you are beach/pool/vacation ready!! Then of course it was time for more coffee 😉 Thankfully Jess felt the same way so we fuelled up again! I found this adorable wrap dress at The Gap, which is part of their new summer collection. I love the fit and detail. Perfect for shopping and coffee dates! The fabric is lightweight and breathable too, which is always nice to have in that summer heat! We finished our day at Mayfair by checking out the latest beauty trends at Sephora. The staff were so sweet, and knowledgeable. They showed us the new Fenty collection by Rihana, and touched up our makeup! Perfect way to end our day at Mayfair. We cannot wait until our next visit to Victoria! 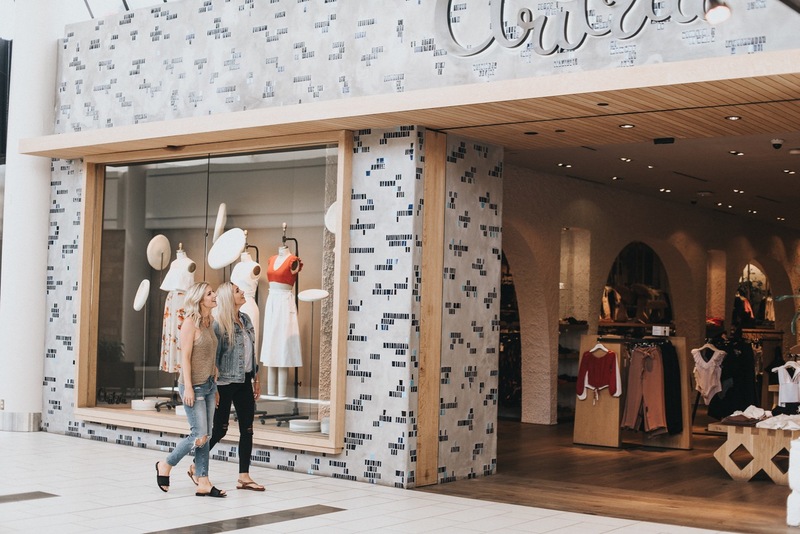 Mayfair Centre will be opening 18 new stores this fall. We are so curious to see what will open!! Stay up to date by following Mayfair on Instagram here. All items featured are available at Mayfair Centre. 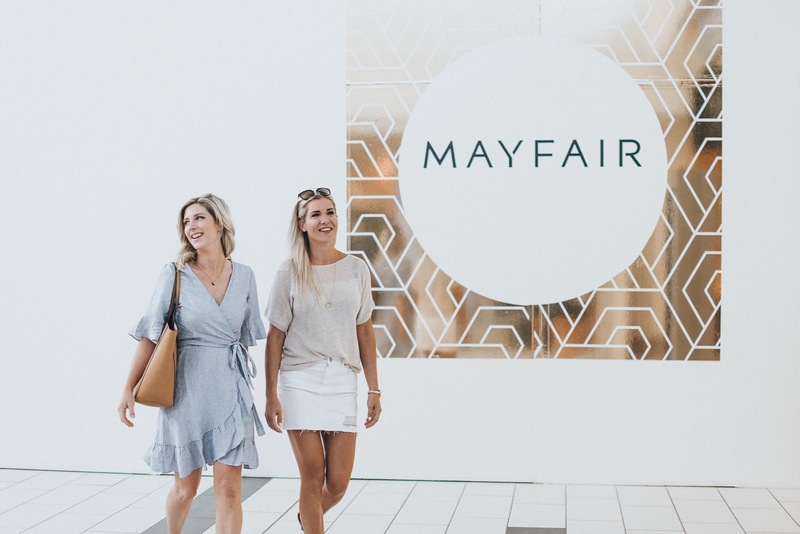 Whether you are a local to Victoria, or you are planning a trip, Mayfair is your one-stop shop this summer! Want Jessica’s outfit details?? 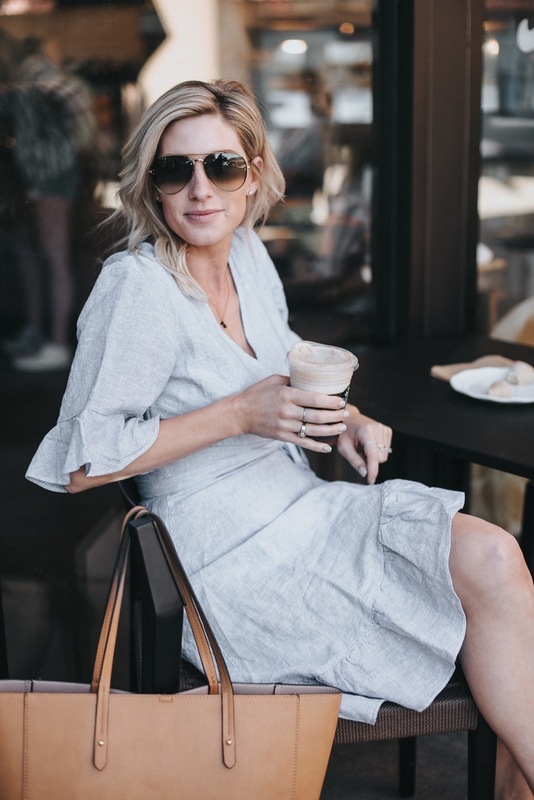 Head on over to her blog post here! In collaboration with Mayfair Centre / Photography by Idlewild Photo Co.